My friend Johnny Johnston recently recommended a book by Christopher McDougall called “Natural Born Heroes – How a Daring Band of Misfits Mastered the Lost Secrets of Strength and Endurance”. 20 years ago Johnny and I used to row together at university and since then he has done all sorts including bare foot running, cross-fit and white-collar boxing. Almost all of his training has been high intensity, maximal output that he has combined with the fast paced life of a headhunter while living in London and then New York. So, I expected Natural Born Heroes to be a high testosterone extreme fitness text, but it isn’t. It’s a mix of a swashbuckling war story, a lesson on Greek mythology and an analysis of human movement and it has made me think a lot about the fact that the human body needs so little to survive and is capable of such incredible feats. It’s made me think about what that means for me and how I think about my own body which I am demanding more and more of in pursuit of a cure for paralysis. It is the ‘tools of the hero – natural movement, extraordinary endurance, and efficient nutrition’ that are so engaging in this book. Johnny is applying it to his training and nutrition. He had an in-depth health check and found that his anaerobic (without oxygen) top end fitness was excellent, but his aerobic (with oxygen) base fitness was poor. So, he followed the Phil Maffetone 2-Week Test – in the book, experimenting with long slow runs at a heart rate of 140 (calculated at 180 minus his age) in order to build a base of aerobic fitness. He also reduced his carbohydrate intake and increased his protein and fat consumption. After 3 months the results were dramatic. In particular, Johnny’s lean muscle mass increased. Despite being ‘thin’ his body fat was 19% and it has reduced to 14% – not bad Johnny! Natural Born Heroes is also informing my thinking about nutrition as I pursue a cure for paralysis. Over the last 6 weeks as part of our scientific research study here in Dublin, which I blogged about last month, I have completed my own battery of health checks in order to capture baseline data. I’ve had MRIs to establish my muscle profile, Dexa scans to determine bone density and body fat composition and I have had a full blood profile done. 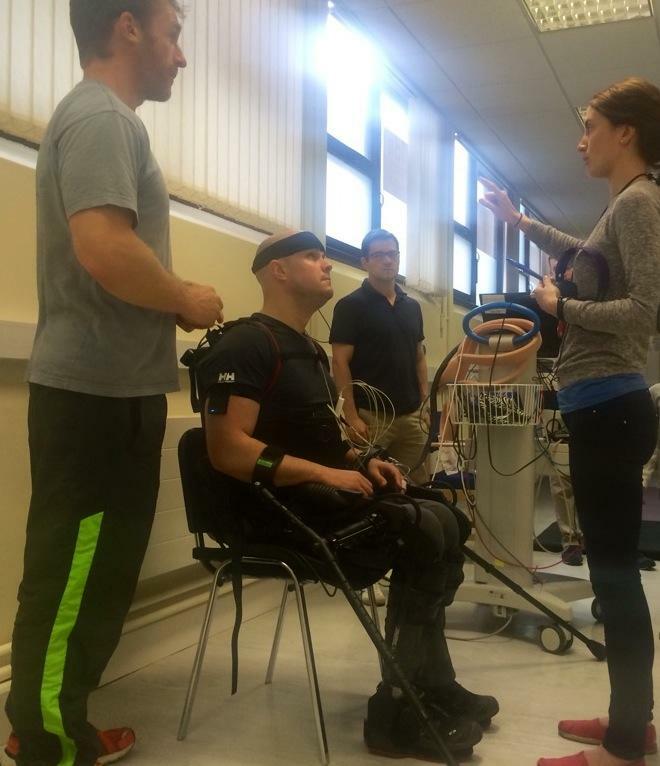 The tests will be repeated and compared at regular intervals over the next 12 months as part of our research into the effect of electrical stimulation on my spinal cord and a drug to super-charge my nervous system while I stand and walk hundreds of thousands of steps in my Ekso Bionics robotic legs. By the time I got to these baseline tests I didn’t need them to tell me that I had put on a load of weight since last year. To be precise 5kgs (11 pounds), let’s just call it a stone, of an increase. And, if I wasn’t prepared to listen to the clothes tightening around me, people were already saying, “you must be training hard“. You see, as I outlined in my blog called, ‘I’ve Gone Part-Time Paleo’ – people always say that when I’ve been eating harder than I’ve been training. So, I started the Phil Maffetone 2-Week Test to see if I could get my weight back on track. I am 3 weeks in and really excited about how I am feeling and by the dramatic reduction in the size of my stomach. I’ve been starting most days with a protein and fat rich breakfast of scrambled eggs with cheese or meat. Meat, eggs, cheese are all an option but not bread, cereal or sugar. During the day I’ve been snacking on biltong kindly sponsored by Stript Snacks and nuts. And, for lunch and dinner I’ve been eating a mix of Paleo stews, Banting meals and lots of spinach and kale. If I need something different in the next few weeks I’ll rely on Life Style Sports Run In The Dark Foodie Tina Bergin’s protein rich running treat recipes on the RunInTheDark.org Nutrition Blog – thanks Tina! Natural Born Heroes has encouraged me to remain curious about my human body and its personal struggle to move despite paralysis. It’s reminded me to fuel it with the right nutrition and, like that ‘band of Resistance fighters’, to try to go beyond the apparent limits of my paralysis. For those of you who are joining us at the Life Style Sports Run in the Dark in November – I strongly recommend that you consider the ‘tools of the hero’ as outlined in Natural Born Heroes – ‘natural movement, extraordinary endurance, and efficient nutrition’! !